Melbourne will soon be bursting with festive cheer as the Chinese New Year Melbourne Festival envelopes the city to welcome in the new Lunar New Year in February 2019. For 16 days from February 2nd to 17th, the city will come alive with events across some of Melbourne’s most treasured landmarks including the Melbourne Museum, the Melbourne Convention and Exhibition Centre, Queensbridge Square, the Docklands and South Wharf. The Chinese New Year Melbourne Festival will open officially at Queensbridge Square on February 2nd with incredible Lion and Dragon dance performances, ladies in exquisite clothing from an array of ancient dynasties along with a slew of Chinese cultural activities. City of Melbourne Lord Mayor, Sally Capp, will be in attendance to officially open the festival. “One of our city’s favourite events, the Chinese New Year Festival Melbourne 2019, unites families and friends to celebrate Chinese culture and traditions across the city,” said Sally Capp, Lord Mayor of Melbourne. “This year will be our biggest celebration yet, with activations from the north of the city at the Melbourne Museum across to festivities and cultural activities at Southbank and South Wharf, in addition to our wonderful dragon boat Regatta held at the Docklands,” said Thomas Ling, chairman of CNY United, the incorporated body established to manage the Festival. Other exciting activities include Lion dances, a special dinner for international students, Chinese costume shows, stilt walking displays and opera performances. Queensbridge Square will come alive with the Street of Chinese Cuisine on February 2nd and 3rd with a focus on Chinese New Year food such as dumplings, sweet rice cakes and spring rolls with special cooking demonstrations from 2017 MasterChef winner Diana Chan, as well as tai chi, martial arts, lantern making and much more. The Chinese New Year Melbourne Festival acknowledges the support of its principal partner, City of Melbourne, Major Partner, The Victorian Multicultural Commission, as well as the support of Melbourne Museum, The State of Victoria and the Federation of Chinese Associations. A very special program has been developed for this year’s closing ceremony, full of light and colour that will illuminate the city. Performances include a lantern parade with the fire dragon and the glowing lions, and a closing ceremony dance. Kids and families will also have the opportunity to dance with the performers, learning authentic Chinese routines to traditional music. A world-renowned Chinese Arts delegation is coming to Melbourne to treat guests to a traditional Chinese concert. The gala attracts over 1500 people annually, with this year expecting to be more impressive than ever before. Hosted by The Oriental Arts Company and supported by local Chinese performers, the dynamic collaboration will come to life at the Melbourne Convention and Exhibition Centre for one night only. After the success of their previous visit, the Shanghai Artists Delegation has added more talent to the line-up of their Australian tour this year, with two enchanting operas popular in the eastern regions of China, the Shanghai Opera and the Yue Opera to perform. The evening will also feature stand-up comedy. Made up of artists solely from Shanghai the performance will grace the 2019 Chinese New Year Melbourne Festival and greet the local Chinese community. Directors and leaders of the Australian Shanghai Business Association Inc, the Chinese Museum, and the Melbourne Chinese Song and Dance Troupe, have actively supported “China Year, Eastern Love” to bring it from Shanghai to Melbourne. After its Melbourne performance on 15 February 2019, the show will continue on to Sydney and Brisbane. 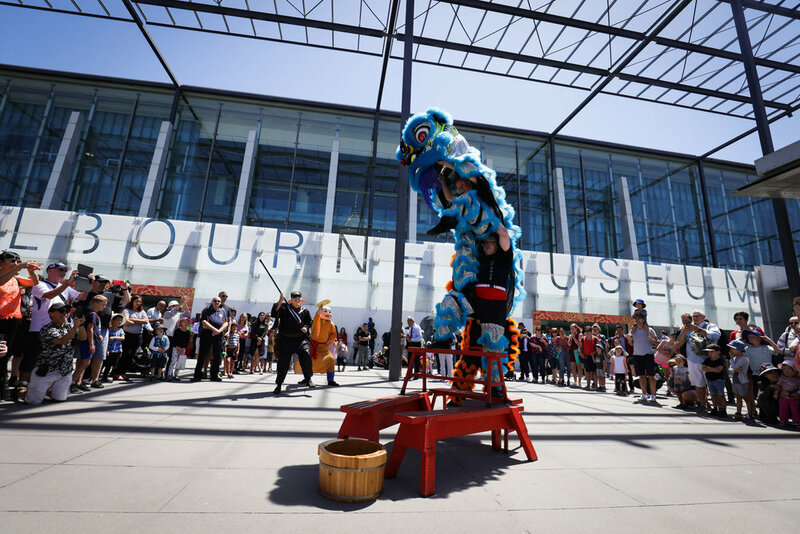 Spread over the course of the weekend, DFO South Wharf will host their own array of activities for visitors to get involved in, from cultural shows and traditional Lion dances to various hands-on workshops including paper cutting, calligraphy and fan painting. Each activity gives visitors the chance to learn about the Chinese New Year Festival in an exciting and engaging way. The 2019 Chinese New Year Melbourne Festival will be officially unveiled by the Lord Mayor of the City of Melbourne, along the Yarra River at Queensbridge Square. Over the course of the day, visitors can enjoy various cultural activities held as part of the Cultural Kaleidoscope program, including Chinese chess competitions, gods of Fortune photo opportunities, Chinese drum practice, traditional calligraphy art, cultural performances, demonstrations and much more. Kids and families are invited to partake in a series of workshops from singing to playing instruments, as well as enjoy a magic show and live music. Then from 6pm, visitors can watch a live food demonstration from the 2017 MasterChef winner Diana Chan before the official opening ceremony kicks off with a traditional Lion dance ceremony. The Cultural Kaleidoscope includes a series of cultural activities within the main area of the Queensbridge Square that showcase Chinese and various other Asian countries’ traditional customs and culture. Marquees will have different programs to suit a range of audiences regardless of the age. This marquee will be the hub of Chinese food and traditional recipes, passed down from generations to generations. Serving up a variety of finger food and shareable dishes that are commonly associated with Chinese New Year such as dumplings, sweet rice cakes, lamb skewers, savory pancakes and spring rolls. This will also be complimented by live cooking demonstrations by the 2017 MasterChef winner Diana Chen, giving the audience the opportunity to learn how to cook traditional meals and understand the background into the tastes and flavours of China. Visitors to the Cultural Kaleidoscope will have the opportunity to partake in a series of cultural workshops and demonstrations throughout the day and into the night. Some of the day activities include cooking shows, traditional tea ceremonies, martial arts demonstrations, traditional instrument classes, Tai Chi, paper cutting, calligraphy, painting, dances, parades, as well as photo opportunities. Then, as the sun goes down, choose from a variety of traditional performances to watch, from dance, parade, Kung Fu, drums, Tai Chi, Square dancing, as well as dance performances from youth groups. Celebrate the eve of 2019 Chinese New Year at Queensbridge Square, the home of Cultural Kaleidoscope. To help ring in the New Year, there will be various exciting stage performances throughout the night including dances, Kung-Fu, costume parades, drums, a magic show, a Lion dance and Latin and hip-hop dances from youth groups. Students from all around the world will come together to celebrate the Year of Pig (2019) in Melbourne. This is a night for students to showcase their skills across a variety of creative mediums including music, dance and singing. Held in the Melbourne Swanston Hall, students can connect with one another and their respective cultures while playing games, cracking riddles and sharing a meal. The details to the event and tickets will be organised by the Student Union and attendance by invitation only. For three days only, The District Docklands will light up to celebrate the Year of Pig in true Chinese style. Kicking things off on Friday 8 February at Fukutontei Ramen, a lion dance will bless the restaurant at noon and then roam through O’Brien Group Arena for a lion dance on ice and through the venue in the evening. Saturday will feature live music, entertainment, and fun activities for the whole family to enjoy. Try your hand at lantern making, painting or paper cutting, or learn how to write your name in Chinese. Dragon Boat racing has been practiced for more than 2000 years, making it one of China’s oldest and most revered traditions. In the Chinese culture, the Dragon is a symbol for good luck and is said to live within the sea and in the clouds, controlling the rainfall. Over the years the racing has come to symbolise a ritual to bring luck and prosperity to a city. The Social Dragon Boat Regatta is an opportunity for the community to get involved in the tradition of fun, with any organisation, company, association, or group of friends able to form a team to be part of this event. The training would be provided. Running throughout the day and in conjunction with other cultural performances, the afternoon will finish off with a presentation to crown the Social Teams winners. Lion Dancers will waltz across the ice and throughout the O’Brien Group Arena in celebration of the Chinese New Year Melbourne Festival. Ice skaters will be joined on the ice by traditional Chinese lion dancers who will welcome good luck and fortune to all as we embrace the year of the pig. Don’t miss your chance to dance with lions this Chinese Lunar New Year. There will be more than 400 water colour, oil, acrylic, ink, and colour pencil paintings created by children from all different backgrounds on display. This event is organised by Australia China Cultural Arts and Education Exchange Association. The Award ceremony will be on Saturday 2nd February 2019 at Ashwood High School Performing Arts Centre, 50 Vannam Dr, Ashwood, Vic 3147. The Federation of Chinese Associations | Australian Shanghainese Business Association Inc. | Asian Business Association of Whitehorse Inc. | Australia China Cultural Arts and Education Exchange Association In.